Matthew Yokobosky was appointed Senior Curator, Fashion and Material Culture in 2018, having most recently held the position of Director of Exhibition Design. Since 1999, Matthew has designed more than 95 temporary and permanent exhibitions at the Brooklyn Museum, including Hiroshige: One Hundred Famous Views of Edo (2000), the critically acclaimed Luce Center for American Art: Visible Storage • Study Center (2001/2005), Basquiat (2005), Annie Leibovitz: A Photographer's Life (2006), © MURAKAMI (2008), Who Shot Rock & Roll: A Photographic History, 1955 to the Present (2009; also exhibition editor), The Fashion World of Jean Paul Gaultier: From the Sidewalk to the Catwalk (2013), Killer Heels: The Art of the High-Heeled Shoe (2014), The Rise of Sneaker Culture (2015), Basquiat: The Unknown Notebooks (2015), Georgia O’Keeffe: Living Modern (2017), and David Bowie is (2018; also coordinating curator). 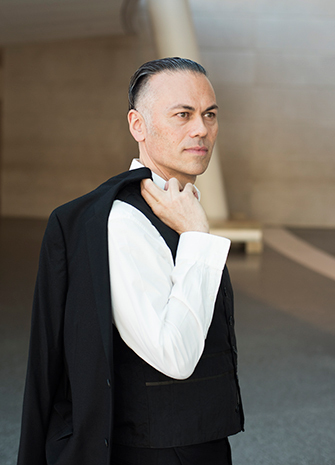 Prior to joining us, Matthew was the Associate Curator of Film and Video at the Whitney Museum of American Art, where he curated No-Wave Cinema, 1978–1987 (1996, international tour), Fashion and Film (1997), Charles Atlas: The Hanged One (1997), and the Eiko & Komo living installation Breath (1998). Also at the Whitney, he was the exhibition designer for Theresa Hak Kyung Cha: Other Things Seen, Other Things Heard (1992), Joseph Stella (1994), 1995 Whitney Biennial, and Edward Steichen (2000), among many others. Matthew has curated and designed exhibitions nationally for the Aldrich Museum of Contemporary Art, Ridgefield, Connecticut, and the Annenberg Space for Photography, Los Angeles, and internationally at the National Museum of Contemporary Art, Seoul; American Center, Paris; Statens Museum for Kunst/National Gallery of Denmark, Copenhagen; and Barbican Centre, London. He won a Bessie award for set and costume design for his work with the theater director Ping Chong.